We know play is important. It is a child’s work. But is there more to it? With current media awareness around mental health, we reflect on how play can make a difference for a child’s long-term mental wellbeing. Mentalhealth.org tells us that 1 in 10 children and young people are affected by mental health issues. This is staggering. We have to ask, ‘why?’. Peter Gray suggests that the rise in depression and anxiety in young people links to a decline in the sense of personal control over their own fate, and that changes are to do with the way they view the world rather than the way the world is. He suggests that anxiety and depression correlates significantly with a person’s sense of control and lack of control over their own lives. In other words – those who believe they are in charge of their own fate are less likely to become anxious or depressed. Gray does emphasise that just because there is a link doesn’t prove that the decline in free play causes the increase in anxiety, depression and helplessness. But, as he states, there is a strong logical case for such causation, one which is worth exploring further. We need to consider, if there is a correlation between control and self-esteem, are there preventative measures we can take with younger children? Psychologist Julien Rotter developed the understanding of the concept of our locus of control. Those with an internal locus of control fare better but today people are more orientated towards extrinsic goals (material rewards, opinions of others, high income, good looks…). He goes on to explain that for young people these goals could largely be caused by a decline in opportunities for free play. Without play it could be argued that children are depending more on the extrinsic goals (instant gratification that social media now brings is one example). In school we know that self-esteem plays a significant factor in a child’s ability to learn. We know that happy, safe, emotionally secure children are more willing and able to learn effectively. They are more willing to take risks, approach challenges and subsequently make greater progress. So, how do we teach them through play to develop positive thinking, for high self-esteem? Gray suggests that free play is nature’s way of teaching children that they are not helpless. When playing away from adults, children have control and can practise asserting this. With increased control over decisions behind the play, they create their own rules, solve their own problems, learn to co-operate and be an equal among peers. Importantly, to us at Kitcamp, vigorous outdoor play provides opportunities for children to find ways to control their bodies and certain amounts of fear, as they assess their own levels of risk and physical challenge. Equally beneficial, in social play they learn to negotiate and resolve conflict. Observing children with one kit trying to build three dens highlighted this as they negotiated swapping pieces, argued about how to construct and ultimately agreed on the final builds. Hara Estroff Marano explains how play helps children to control themselves and to interact with others and through play cognitive agility really develops. What if Gray is right when he suggests that we are creating a world in which children must supress their own instincts, where paths are laid out for them by adults and where we are ‘literally driving young people crazy’. Ironically it is still us as adults controlling the provision but the more we can set up independent and free play, the more opportunities children will have to develop many of the skills needed to build positive self-esteem. fresh air, when setting up outside. 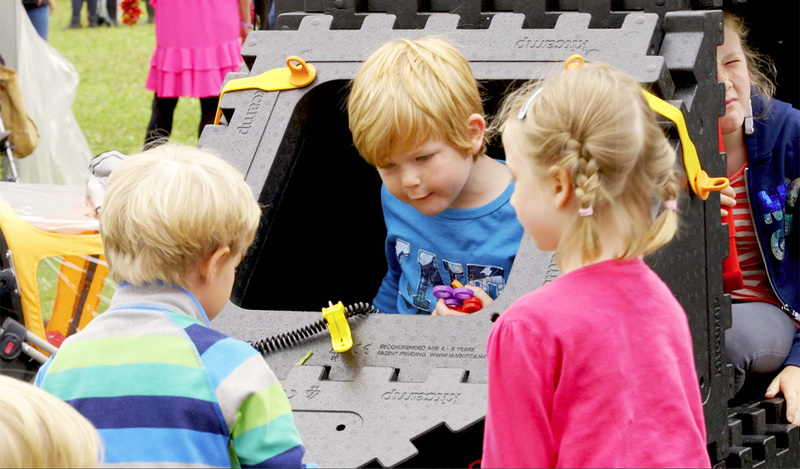 For enquires about the positive reinforcements that Kitcamp can bring for children’s play, contact us. The Mental Health Foundations top 10 tips for looking after mental health. TED talks: Why you should take time to play playlist. Play is more than just fun, it’s vital, Stuart Brown. The decline of play, Peter Gray.